FleetCommander fleet and motor pool software is an enterprise-class, web-based application that scales to meet your needs. We are a great fit for fleets ranging in size from 25 vehicles up to thousands of vehicles. We can accommodate an unlimited number of users and we are confident that no other provider of fleet and motor pool software, hardware, services offers the value of our solution at such a competitive price. Our pricing is based on the solutions you need. Although the application is used by extremely large fleets, including Fortune 100 companies and government entities of all sizes, the site is also perfect for smaller fleets. You choose what you need. Number of vehicles managed - FleetCommander software licenses are based on the number of vehicle you need to manage. We have hundreds of hardware options as well as peripherals to maximize the benefit of your hardware solution. Tell us what you are trying to achieve and we’ll help you find the right hardware. 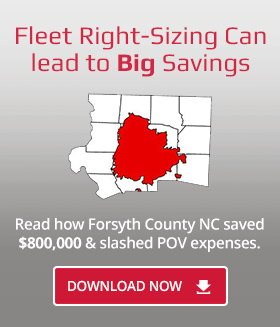 With FleetCommander, County Agency’s fleet will reap benefits by reducing vehicles and by optimizing the use of their fleet staff. The total number of vehicles will be reduced when there are efficient and effective ways to share. With our automated tools, we’ll streamline fleet operations and give them visibility into their fleet’s utilization. Conservative estimates of fleet reduction are 15%--or more. Check out the savings County Agency will be able to achieve for the citizens of Great City.